A slimmed-down obese dog who once resembled a “pot-bellied pig” after surviving on a diet of hamburgers has been adopted by one of her rescuers. Hattie was dubbed “Britain’s fattest dog” when she arrived at Gables Farm in Devon weighing almost 40kg (6st). Nicknamed Hattie the Fatty, the portly pooch won hearts worldwide as she slimmed to 23kg (3st 8lb). Hundreds of rehoming applications rolled in but foster carer Ruth Rickard realised she had fallen for Hattie. “I couldn’t imagine her living with anyone else,” she said. “I did get very attached to her and all her little funny ways. Hattie was morbidly obese, diabetic and almost blind when she arrived at the dogs and cats home in April last year. Mrs Rickard, who is a deputy manager at the shelter, said she recalled mistaking the plump pup for a “pot-bellied pig” when she walked through the door. 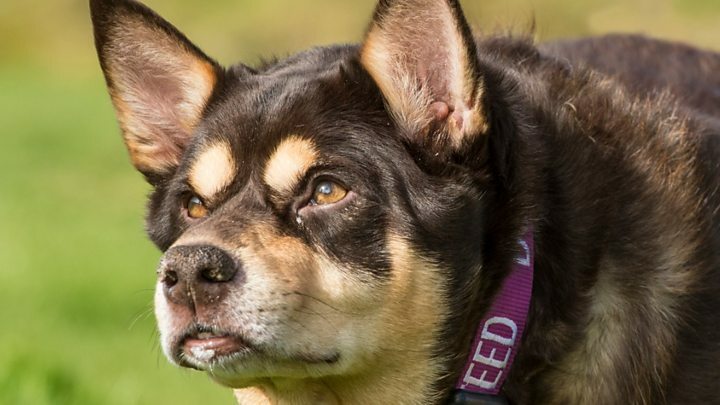 The eight-year-old collie-cross, who was rescued by the RSPCA over welfare concerns, was put on a strict regime of diet and exercise to help her lose weight safely and slowly. The charity also set up a fundraiser to help cover her vet bills, including twice-daily insulin shots and cataracts surgery to restore her vision. Hattie joins Mrs Rickard’s dog Brady and cat Parker – both also former rescues from Gables Farm – in her new home, which is a short walk from the farm. The animal shelter has also hit the headlines for taking in chunky characters such as collie Bopper the Whopper and Large Marge, an overweight cat.